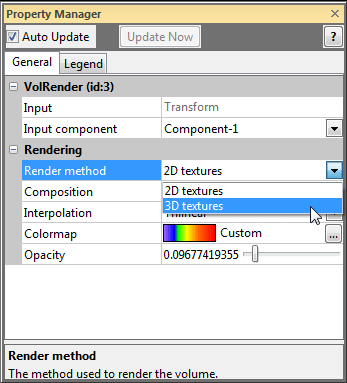 Why are the 3D Textures and Paletted Textures options for Voxler's VolRender so slow? The availability of the Render Method 2D Textures, 3D Textures, and Paletted Textures is a function of your video graphics card and driver. Different cards and drivers have different features available. Some features are emulated in software and are much slower than features enabled by hardware. Newer graphics cards sometimes come with additional rendering features and improved performance. features through hardware and are much faster. How can I create a volume from my gridded data in Voxler via automation? Why does Voxler seem to be running slowly? How can I interpolate data in Voxler using automation?